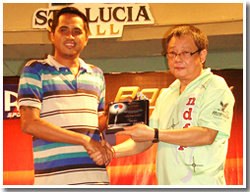 The National Darts Federation of the Philippines (NDFP) awarded this year’s set of NDFP National Masters and recipient of the very first President’s Award at the recently concluded P110,000 Free Registration Darterong Pinoy 2010 last November 13, 2010, at the Basement Activity Hall of the Sta. Lucia Mall in Cainta, Rizal. Since the inception of the NDFP, it has strived to set the highest standards and cultivate a new culture of excellence, to professionalize and uplift the sport of darts, and to attain international recognition and respect for its players. Key to the thrust of the NDFP is recognizing individuals and organizations that have set and met the standards of excellence in their own fields of dart endeavors. Hence, the NDFP institutionalized the NDFP National Masters – a recognition of darters who have won at least three (3) open singles since 2005 in three (3) NDFP ranking tournaments, each worth P75,000 and over. 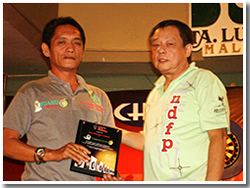 The NDFP National Masters of today are considered an elite group of players who have attained these standards of distinction and superiority in meeting the challenge of dart competitions. So far, the NDFP has given recognition to four (4) National Masters: (1) Bert Lozano, NDFP 7th ranked player with three titles; (2) Jojo Barellano, NDFP 4th ranked player with five titles; (3) Ian Perez, NDFP 2nd ranked player with 8 titles, and; (4) Boie Parfan, NDFP number 1 ranked player with 11 titles since 2005. This year, the NDFP added three (3) outstanding players to the elite circle of the NDFP National Masters. Held on the 13th of November, at the highlight of the second day of Darterong Pinoy 2010, the NDFP formally welcomed to the NDFP National Masters Circle Dixie Ibanez, Lourence Ilagan, and Juanito Boy Gionson. Dixie Ibanez of Cagayan de Oro City, NDFP 10th ranked player, is one of the hottest dart players in Mindanao today, having won three (3) major NDFP ranking singles for this year alone: the Mayor Sammy Co Cup in Pagadian City, the 100K Tinalak, and the Hinugay Open. Lourence Ilagan of Cainta, NDFP 8th ranked player and defending Darterong Pinoy 2009 Champion, won titles in Darterong Pinoy 2008, the Philippine Qualifier to World Dart Championship 2008, and the 5 Million Manny Pacquiao International Darts Classic in 2009. Juanito “Boy” Gionson of Navotas City, NDFP 3rd ranked player, championed in the Robson Summer Dartfest in 2009, the Governor Deloso Cup in Zambales, and this year’s P200,000 Lhullier Cebu Open, and the Nom-e Dart Open in Carmona, Cavite. He will represent the Philippines to the World Dart Championship in England this December. The President’s Award is given to individuals or organizations who demonstrated exemplary leadership in unity, progress, and change towards the attainment of the NDFP’s vision for a unified dart country and excellence through the highest standards of darts tournaments. The President’s Award was given to the Federation of Dart Associations – Metro Davao, Inc. (FDAMDI) through its president, Engineer Bonifacio Boy Gludo, for successfully unifying the splintered darters of Davao City, and eventually expanded into a strong regional federation to include Tagum, Panabo, and Carmen in Davao del Norte, the City of Digos in Davao del Sur. 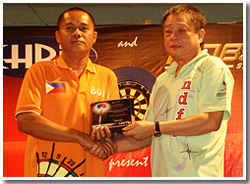 The FDAMDI supports players to national tournaments, manage their dart venues, and host the yearly Kadayawan Dart Tournament. copyright 2005 - 2010 www.ndfpdarts.com All Rights Reserved.